The LEGO Dimensions game is The LEGO Group's first foray into the growing field of “Toys to Life”, where physical toys with RFID tags can be pulled into your gaming experience by placing the toy on a special portal. The gameplay is based on the hugely successful LEGO Star Wars, Harry Potter, Indiana Jones and more, by video game developer TT. I purchased the Starter Pack on Black Friday, and wanted to better understand what I was getting myself into before I started purchasing any of the Level Packs, Team Packs, or Fun Packs. At 30/25/15$ each (respectively) these little purchases will add up quickly. This is why I wanted to understand how much I would need to pay to experience the whole game. What I've concluded is that the base game is a pretty decent value, especially if you consider that LEGO bricks are worth about 0.10$ each piece. The value of the expansions seems to vary. 100$ – Starter Pack Only – Just buy the Starter Pack and play through the main game and three adventure worlds. 315$ – All Levels and Adventure Worlds – By purchasing the right sets, you can unlock the entire game. You will still miss some puzzles which require a specific character. 390$ – All Levels, Adventure Worlds, and Character/Vehicle Abilities – A carefully selected set of Fun Packs will give you every in-game ability. 565$ – Everything – If you want every character, vehicle and Accessory, it’s going to cost a premium! Don't forget that the new content comes out every two months, so there are plenty of ways to spend even more in the future! One thing I didn't cover in the article is the option of purchasing used LEGO Dimensions kits. In practical terms, the LEGO minifigure or mini models aren't required to play the game - all that the portal sees is the RFID chip in the base. As such, you can sell the minifigures and still play the game, or buy just the RFID disks. I do not believe any user data is stored in the RFID disk, but I'm not 100% sure. I know, for example, that the vehicles in the game can earn upgrades. That data about your vehicle upgrades might sit on a LEGO Dimensions server associated with your Gamer ID, or it might sit on the disk itself. Question: Does anyone have experience borrowing a friend's LEGO Dimensions kits, or buying used sets? Yeah the information doesn't sit on the discs. It asks you to tie the vehicle in to the specific tag, even the first time. The extra tech needed to do this would be a complete waste compared to doing it with software. And I have used bases, although I have no way of knowing if they were actually used (if you see what I mean). And Lego have undermined your calculations a bit by offering hire a hero (with in game currency). Meaning you can have access to all abilities (but not areas) effectively free. @MattsWhat, Great point on the "Hire a Hero" capability - I will update the article at some point to reflect the fact that you can skip some of the seldom-needed characters and use Hire A Hero instead. I have heard that Hire a Hero cost goes up every time you use it, though. I'm sure that it becomes cost prohibitive eventually. 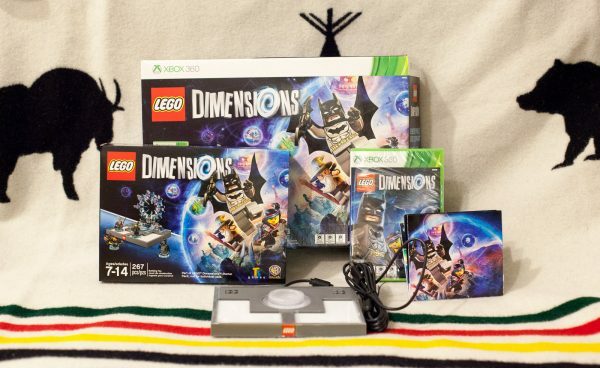 I just purchased used LEGO Dimension disks for a good price (no minifigures or microscale models), and will let people know if I have any problems using them in the game. If not, this is probably the most cost effective way to enjoy the entire Dimensions videogame world. Also as @henrysunset stated above, everything all together is $565 in USA. Everything in Canada would be $575 CAD which would be $417.95 USD. I acquired most of the discs between 20% and 30% of the retail cost of the pack, w/o minifigures or mini-builds. $3.75 for the discs from the fun packs, etc. I think the acquisition cost for the discs would be around $120.00. The Starter Pack was around $69.00 on Black Friday. I'm alright with the amount of content for around $200.00. It's had the equivalent game play of three regular Lego games. Dimension starters are now $59.99 at most large retailers.